The Beasts love the bouncy & chewy bones. 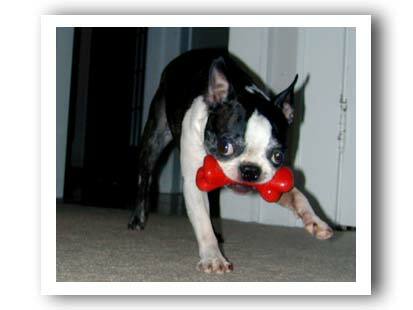 They are also 'Personal-Size' toys - a small fits perfectly in a Boston Terrier sized mouth. This is a Christmas Present Review. The Beasts unwrapped these minty presents themelves. They were very excited to see what was inside! 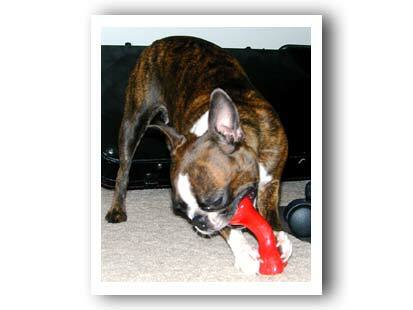 They love the bone shape and they are flexible and bouncy. The smalls fit right in their mouths and are a little too short for tug of war. Bergamot likes this feature because Emrys won't terrorize him & grab if from him (as much). "I can run around with glee & Emrys can't steal it!" "I like to hold this toy between my paws and chew it!" There are no marks on the Orbee Tuff-Bones yet. 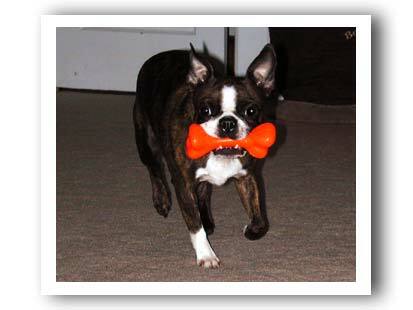 Update September 2009: We still have our Orbee Bones! If they last as long as I think they are going to last these bones will be well worth the purchase price. 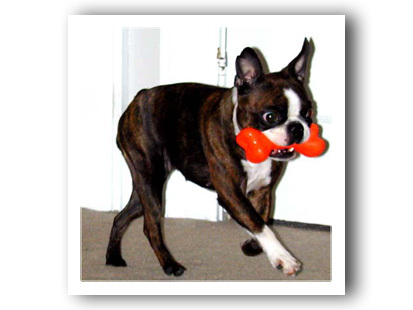 The Beasts haven't put a dent in them yet - but as always keep an eye on your Boston Terrier with any toy. I'll chew it right in front of him!